norms and rules of governance were introduced by the British both in the territories directly administered by them as well as through the instrument of Treaties with those of the native Principalities in Haryana. In the wake of the peaceful atmosphere that followed, the people returned to their normal occupations and begin to earn money and create wealth. As the Muslim power had waned, the Hindus could now improve upon or take up many other fine faculties such as arts, crafts, building edifices of all sorts, pursue education and restore forgotten festivals and ceremonies. However, several decades more had to pass after the uprising of 1857 when the people began to really pay some attention to erect buildings – religious, secular and dwelling houses, in a decorative and embellished forms. One such edifice that the village communities could think of was the Chaupal. or for holding public meeting and listening to the address of local leaders or for lodging a large number of guests that suddenly arrived. There is mention of village guesthouses in the old Hindu treatises but the tradition seems to have ceased as most of north India was ravaged by Muslim invaders for quite a long time in view of which permanent or enduring structures could be neither raised nor regularly maintained. There is mention of the existence of wayside Dharmshalas and Serais both near the human habitations as well as on the regular caravan roads that were used by travelers, ferrying merchandise, serving as shelter for the incapacitated, the troops as well as shepherds, thieves and thugs. However, the modern Chaupal as is generally known and identified with a huge masonry and embellished community building in Haryana actually came into existence only about one hundred and fifty years ago. of the kuchcha status of the building, the walls used to be occasionally embellished with motifs and figures of plants, auspicious animals and human being drawn in folk style, which tradition continued even for the pucca buildings raised later. As evidence of embellishment in a kuchcha system could not be recorded due to their perishing nature, the old treatises invariably mentioned about the decorations. A robust beam of Shalva tree that was put across for supporting the rafters of the roof of the central assembly or audience hall was further strengthened with the wooden brackets, often bearing beautiful floral motifs in carving. The wooden frames of the windows and alcoves provided in the walls for ventilation and keeping of articles, respectively had carvings. Much later, probably in the last decades of the nineteenth century, the village communities devised social ways and means for securing financial resources for the erection of many a fine masonry or pucca Chaupals in which several traditional decorative styles such as wall paintings came to be adopted. in a year or failed successively for a couple of year, the tragedy could strike. The problem was aggravated when even the winter crops failed as neither the fodder nor the grains could be available in sufficient quantity, which could sustain life. A number of famines hit eastern districts of the Punjab (now in Haryana in the nineteenth and the early twentieth centuries. In spite of the natural calamities and large scale internal migration of both- the people as well as the cattle, the people held on their occupations and returned to the usual routine of life as soon as the conditions became ideal for supporting life in normal way. It may be amazing to note that many large edifices, particularly the masonry tanks, were built in Haryana during the major famines that occurred in the nineteenth century. One obvious reason was to provide employment to the people and prevent them from migrating to other neighboring regions that could have caused administrative problems. Financial Resources: The agricultural production really increased in the central and northern regions of Haryana only after the British paid sufficient attention towards surveying the terrain and digging canals for augmenting the irrigation. The peasants could be encouraged to raise cash crops and sold their produce to the local Mahajans or the traders who used to live in villages. There was hardly any old and large village in Haryana that did not have one or two dwellings of this trading community: some of them had even 200 homes of Mahajans such as Beri, Behal, Meham and Niwazpur (dist. Rewari). The Mahajans collected the agricultural produce from the peasants, carted it to grain marts located in the cities and occasionally exported to deficient regions elsewhere in the country. Most of the grains and other agricultural commodities such as raw sugar, jaggery, cotton, jute and oil seeds were procured in large quantities by the British government for the Army. Most of the Mahajans also acted as local agents for the British procurement and logistics department and earned fabulous wealth, particularly during the 1st and the 2nd World Wars. A small part of this wealth, however, was also shared by the peasants in the villages who had large chunks of agricultural land and could produce enough and sell the surplus to the Mahajans. With this earning the farming community could now think of erecting both, the havelis as well as Chaupals. The Chaupal, of course, was always built with monetary contributions raised from within the community. It may be mentioned that the other communities such as the Mahajans and the poor or the lower castes did not build Chaupals in a grand style as it was socially not viable. Instead, the Mahajans, who were numerically less in a village used to build Dharamshalas. At some places or villages in which the number of Brahman households were large, had land holdings and a Lambardar of their own, had built Chauapls and embellished them too. making bricks in a desirable number besides reminding them about procuring stone and wood required for various types of fittings. Once over with the standard procedure, he used to fix a date of the ceremony on which the construction work could start. Construction Rituals and Norms: Normally, the construction would start in the auspicious month of Falgun-Chaitra (corresponding to the months of late February-early March) and concluded after a year or so in the same months of the year. The whole process of erecting a Chaupal until it was inaugurated and opened for public use was very cumbersome and labour-intensive that often required boundless perseverance from every person including the headmen, the chief architect and the mason. Timber and stone had to be selected and brought from distant places firstly in railway wagons and then transported to site in bullock carts. The items used to be as heavy as could hardly be carried in one cart pulled by a pair of sturdy bullocks. In such circumstances when metalled roads had not come into vogue and laid, an innovative method of fixing an additional yoke (jood) in front of the cart was applied so that two pair of oxen could pull the load with ease on a dirt road. Stone pillars, brackets and doorjambs were ordered to be carved at sites at which the artisans were usually available. Beautiful and auspicious animals, birds, flowers and foliage and nature gods used to be depicted as motifs in relief carving on all types of stone objects, fittings and items that were fixed for use in the building by the chief architect. Woodwork was taken care of by a carpenter of repute who would select the type of material required for preparing various items and fittings such as door sets, doorjambs, brackets and the central pillar in addition to the balustrades and railing for the parapet to be fixed on both the mezzanine floor in the central hall and the balconies in the front and the projected windows. from the adjoining villages eagerly watched various phases of progress in erecting the superstructure of a grand Chaupal and contributed too as and when an opportunity came into being. It was the responsibility of the chief architect to appoint masons. Usually, the carpentry work was also accomplished by the chief architect but, in case, he could not do it, the village Headmen appointed one whose responsibility was to design and shape the main wooden pillar in the central hall on which the heavy beam and rafters rested. It was the carpenter who also carved attractive and meaningful motifs and figures on the brackets, pedestal and capitol of the pillar, in addition to the doorjambs and panels for the windows. The railing in the parapet used to be a beautiful and imaginative combination of wooden structure inter-fitted with pieces of iron filigree prepared either in cast or forged by the village blacksmith. or Peepul (Ficus religiosa) tree. The courtyard was secure within the high piers in which steps on all the three sides or two in the front were provided for comfortable entry. The steps were deliberately kept narrow to prevent entry of large animals such as bulls, oxen and camels or sudden entry of many people in the building that could disrupt the proceedings or attack the gathering. Wicket gates made of iron bars or wood have been fitted on the steps with padlock to prevent unauthorized entry of urchins. The corners of the main edifice as well the piers were strengthened with pillar-like tapering structures or turrets and to protect the walls from injury from passing bullock carts and motor driven vehicles. The height of the piers from the floor of the courtyard was kept less than two feet so that people could relax and occasionally bathe and wash clothes on its broad shoulders. The designing of the fascia could usually be envisioned with a possibility of incorporating embellishments in a very splendid way of the walls of the Chaupal. The knowledge and acumen of a Master architect and the superb workmanship of the subordinate masons often came to flourish when plenty of freedom was unleashed and adequate material resources gathered for accomplishing a grand form. The design features of the fascia could be accomplished in several possible and innovative ways such as exposed brick masonry with decorative elements carved by chiseling or through stucco on the brick masonry wall. It could be amply illustrated with certain examples such as the Chaupal at Karmara that were gathered from Haryana. were also built atop the well of the staircase as came to be noticed in a few Chaupals at villages Kheri Sadh (near Rohtak) and Serdha (in dist. Kaithal). At certain places, the exterior of a Chaupal building was decorated with figures, carved in semi-relief (Chitrardha) in the space above the moulding line in the eves (Kapota) to appear as if a sage is sitting in penance. At prominent points in the walls of a Chaupal, or only a gate structure (Darwaja or a Takia) akin to a Chaupal was erected, full figures of prominent and contemporary social reformers or community leaders such as Swami Dayanand Saraswati, Jawahar Lal Nehru, Mahatma Gandhi or Deenbandhu Sir Chhotu Ram were carved. Obviously, the base of such figures was done in lakhauri bricks over which the paste of chunam was clad to bring out a figure. Such figures, as indicated were noticed in a Chaupal at Bhaini Amirpur (dist. Hisar and Dighal (dist.Jhajjar). It is a well-known fact that every age in history has its own peculiar taste in architecture that sometime remains in vogue for three to four generations. As new taste and materials for construction evolve the old ones and, with it, the methods of applying it decline and become redundant. This certainly gives rise to a new problem i.e. of the maintenance and/or restoration of the old buildings and edifices of heritage value. It has been often seen that the village communities seldom restored the grandeur of the buildings erected for various purposes by their forefathers. This is a sort of boon in disguise for art-historians as well as challenge for conservation architects to see professional opportunity in it. In any case, nobody may wish that the old and heritage value structures whether important from the point of art and architecture or for the study of history, should crumble. Whatever may have been the attitude and schemes of the government of the day, the human intelligence has shaped policies that recommended the preservation and conservation of old structures. In regard to the Chaupals, it came to be noticed that the embellishing features and the decorative work that used to enhance the looks has either deteriorated over a long period due to neglect or altered due to renovation, at several places. Restoration Challenges: Take for example the Chaupal buildings at Bhaini Chadrapal, Sisar Khas, Kheri Sadh, Karmara and Chhattar or for this matter other villages in Haryana. The wholesome temperament of the people or the section of the village community i.e. a Thola, that owns a Chaupal has transformed over the years. It is quite at inconsistency with their forefathers who had the vision to create beautiful structures and got them embellished with frescoes and figures in relief created in stucco. The modern generation is quite oblivious to these decorative elements and does not wish to preserve them with care and love as vestige of village or community level architecture. As value of land and property for both residential as well as commercial purposes has increased manifold during the decade, the modern generation thinks it worthwhile to invest savings in private business rather than donating a part of it for restoration of an old, secular edifice or erection of a new building for community use. The maintenance of Chaupals is considered as the responsibility of the government as if it were a sacred function. The village communities nowadays vie for grants from public funds for construction of a new Chaupal building of ordinary design on the same plot on which the grand old edifice of a Chaupal had crumbled due to negligence. On the other hand at places in which the grants from public funds were used, the mission was not to seek restoration or preservation of community buildings but complete repair with new age materials in which process the entire body of embellishment become a victim such as the Chaupal of village Majri in dist. Jhajjar. With least application of mind such politically motivated monetary were utilized in such a shabby and clumsy manner as destroyed the old look and also completely covered the wall-painting, considered as an important source of the art history of the region. 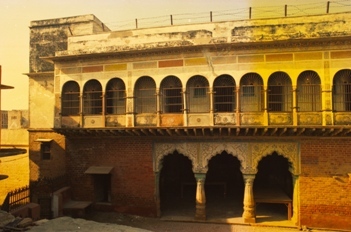 A few years ago the exposed brick Chaupal at Karmara was covered with a coat of ‘snowcem’ – a kind of cement based paint, thus destroying the aesthetics of the whole structure. 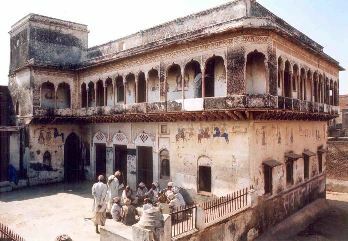 This Chaupal was built in the years 1887-89 with funds raised by the residents of the entire village, mostly inhabited by the Jats. The ground plan, layout of the superstructure and embellishing features were envisioned by Bhadawa, the chief architect from village Bhana in dist. Kaithal. The cement coat was applied on the entire un-plastered brick surface of the building that not only concealed the natural reddish-brown colour of the baked bricks but also altered the looks. On the other hand the buildings of other Chaupals that were originally plastered with chunam –prepared by mixing treated lime with Bel fruit pulp, pulse of Urad, jaggery, jute fiber and seeds of Guar in appropriate quantities and pounded while water was periodically sprinkled until turned into an adhesive paste , were repaired in cement mixed with river sand. It was latergiven a coat of white lime to ensure that the damage was complet! Many a Chaupal buildings that were plastered with chunam were embellished by Chiteyras –traditional painters, with frescoes depicting themes from the Hindu pantheon, mythology, history, religion and folklore. Utmost caution was observed while the frescoes were creative as narratives such as the life and time of Lord Krishna or the Mahabharata or a few other prominent incidents worth depicting in a thematic mode. As a result of the unscrupulous repair followed by several coats of white lime over a period of time, the valuable treasure of art history of Haryana in the form of paintings on the walls largely vanished. Most of the repair and white wash work was taken up when the State government released grants from public funds for the repair and restoration of community buildings such as Chaupals. As neither the village communities was adequately equipped in handling this kind of work nor the concerned funding department or any other agency of the State government the whole operation fizzled out destroying the vestige of the art work and embellishing features in these Chaupals. Regrettably, no infrastructure for suitable and timely scientific guidance for the restoration of a large number of heritage value Chaupals or other edifices exists nowadays in Haryana. Certain buildings of the Chaupals, such the one in Bhiman Patti at Farmana Khas village near Meham located on NH-10, was entirely demolished a few years ago despite several persuasions by the author for its restoration in the traditional method. The physical condition of the Chaupal at village Shamlo Kalan (dist. Jind), as noticed in the year 2006, had indicated deterioration to such an extent as required immediate intervention of the conservation architects for preserving the structure and its decorative elements including about a hundred rare frescoes on the wall. 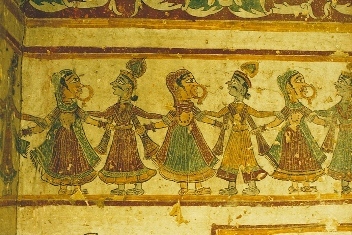 The mentionable feature about the frescoes was the themes that substantially represented the folklore and popular legends, which were endearing to the village communities, particularly the Gathwala Jats of the village who had long cherished the themes. The third instance is that of a Chaupal in village Majri situated in the south of Bahadurgarh town, dist. Jhajjar. After completing the repair work the village Headmen approved of engaging workmen and an artist. Whereas the former coated the surface of the walls with enamel paint, including the stone pillars, the latter re-created the figures by using the faint line impressions of the previously done frescoes that were barely visible through the fresh coat. The artist was a novice with little understanding of the techniqe of creating or conserving frescoes in the traditional mode and attaching aesthetic value to this form of work of art in architecture. In re-doing the aesthetics of the Chaupal was completely lost after a gap of 90 years, when the edifice was built about 1923 AD. The former artists had created the figures in secco-tempera method by using vegetable dyes on the semi-dry chunam surface. Although the entire look of the Chaupal might have looked appealing to the new age Headmen yet the alteration in the character of this Chaupal could not have been overlooked as pointed out by a few concerned persons when the author visited the site sometime in 2009. Such obliteration of artistic work of yore has become so rampant and uncontrollable in respect of decorated Chaupals located in hundreds of villages of Haryana that any effort to transcend wisdom for appropriate application of methods for restoration falls on deaf ears. Features and Opinions: A study into the sociology of Chaupals from point of view of public art in architecture is as interesting and fascinating as their utilitarian significance provided by comfortable and soothing design obtained through attractive architecture. Their outer appearance is literally a beholder’s joy and at several places the decorated inner spaces of these buildings really offer a visual delight. Several early publications and District Gazetteers of Haryana (then Punjab district series) including ‘The Wisdom and Waste in the Punjab Village’ and ‘The Punjab Peasant in Prosperity and Debt’, both by Malcolm Lyall Darling written and/or compiled by the British officers between 1879-1934, vividly and briefly indicated about the existence and functional importance of the Chaupals. In describing features of Chaupals, they preferred to use native words (or vernacular vocabulary). ‘The district gazetteers of Karnal and Rohtak, both of 1883 AD, contain word sketches of such buildings and how these came to be erected. For lack of obligation, describing the architectural beauty and appreciation of the inner décor of Chaupals when they were marvelously fresh and enchanting was, perhaps, a great lapse (on the part of British officers). ‘A systematic survey conducted by the author for evaluating the art and architecture of Chaupals in Haryana has yielded valuable information. 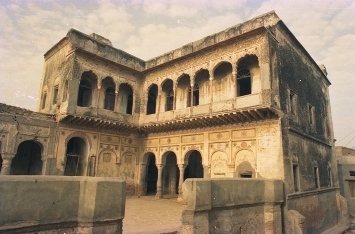 It was discovered that the political tranquility, low crime, strong kinship affiliations and community based bonding conjoined with non-interference by British officialdom were the reasons responsible for evolving of an environment conducive for erection of artistically rich, aesthetically pleasing and architecturally superior and environmentally suitable Chaupal buildings in villages of Haryana. The material and skill needed for execution of these public works of civil engineering did not suddenly emerge nor were they imported from neighbouring Rajasthan. It slowly evolved from a combination of various elements of the traditional Indian (Buddhist, Hindu and Islamic) and colonial architecture, the latter imbibing features of European dwellings. Amazingly, no blueprints for edifices of yore were ever prepared on paper like the modern civil engineers do, yet the layout of the buildings was perfect. The bricks were preferably plained (or smoothened) by grinding three surfaces –one longitudinal and two sidereal, so that it could be fixed in a way that presented the outer surface of the wall as smooth. 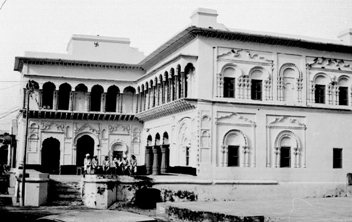 ‘Jharokhas (shell shaped projected balconies) were also built in Chaupals as the design could permit. Jharokhas in Chaupals at villages Jhanjh Kalan, Bhaini Amirpur, Mundlana and Kheri Sadh added to the architectural beauty of the buildings. With the thick walls, jharokhas, jalis, mezzanine floors, high platform and the roof, the thermal efficiency of the Chaupal building was close to the comfortable zone of temperature for humans. The Chaupal of the Sindhu Jats at Kheri Sadh village, dist. Rohtak and another at Kithana village, about 26 kilometers from Jind town towards Kaithal, offers unique features for capturing air currents through jharokhas and balconies. 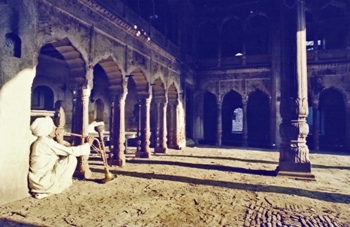 ‘Such was the precision and great acumen in the creation of false doors having meticulously shaped friezes and support pillars that even a casual visitor could stop and appreciate the beauty of the Chaupal building.. A carved pillar could have, at least up to 10 features, which meant that below the capital it could have an entablature, having echinus and annulets, collar, fluting, apophyge and cincture. Between the walls and the wooden beams, coving was also done. These features radiated a symbiotic appearance to the wholesomeness of a Chaupal building. In order to reduce wind stress on the top parapet walls of the building, recesses at appropriate places were laid. This central piece in the topmost parapet on the super structure, called Mukut or crown, augmented the aesthetic appearance of the building. At least half a dozen designs of jalis and brackets (todas) with fine carvings came to be noticed during the investigations by the author. The Chaupals of yore, in a sense, were designer houses of yesteryears, which under the transformed milieu face deprivation. These rural heritage buildings will be lost to history if indifferent attitudes in the younger generation continue for another two decades. Many outstanding features came to be observed in the woodwork of Chaupals in Haryana. These mainly related to the ornamentation and forms of the pillars, lintels, brackets and imposts. The pedestal and the capital, of course, were specially ornamented by carvings with floral and other kinds of motifs in a large number of Chaupal buildings such as at Panchi Jatan, Farmana Khas, Naultha, Mirchpur, Ladwa (Hisar), Kathura, Bhambhewa (Jind), Asan and Bahu Akbarpur (Sishay wali Chaupal) in dist. Rohtak and Bawana Lakhu in dist. Panipat. 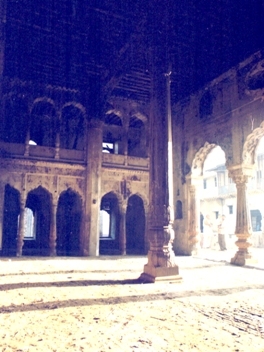 Of the most gracefully ornamented was the pillar of the central hall in the Chaupal of Bhiman Patti in Farmana Khas that was demolished and the wooden fittings sold as scrap, a few years ago. Similarly, wood pillar in the Chaupal building at Bhau Akbarpur bearing ornamental carvings in the pedestal was removed and sold after the Chaupal was demolished a few years ago. On the other hand the ornamented brackets in wood fitted in the Chaupals at Panachi Jatan and Kathura villages were painted in lacquer mixed with golden brown powder of metallic origin whereas the exquisitely carved brackets bearing floral motifs in the old Chaupal at village Mirchpur were removed at the time the ramshackle building was demolished to give way to the new structure. The pair of the bracket with deep carvings bearing floral motifs was disposed of as ‘junk’, later. In olden days it used to be quite a challenging task to search a Sheesham tree from which a log of wood measuring at least 16 to 18 feet in length and about 60 inches of girth. As and when it was obtained the carpenters peeled the skin to obtain heartwood and shaped it in a manner with carvings of floral motifs and inanimate objects such as the Sun. Evidence is adequate to prove that the competence and acumen of the architects, masons and woodcrafts men of yore in Haryana who accomplished marvelous feats in creating superior and aesthetically rich designs of objects and items was not inferior to their counterparts in other regions of India. Chaupal pillar had16 flutes. The spandrel shaped supporting brackets of this pillar were carved to depict floral motifs, the open ends of which were curved to look like tendrils of vines. 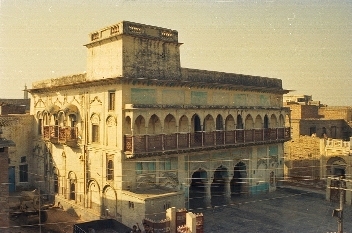 All the ornamental wood work of this Chaupal was sold to scrap dealers sometime in 1997 soon after the building was demolished. In this and a few other instances it was a harrowing experience for the author in failing to infuse a sense of belonging towards the protection of the heritage value edifices and exploring ways and means for re-installing the ornamented items of wood and stone even when a new building was raised for similar purpose. In places where restoration of the edifice with moderate efforts and intervention appeared feasible, even then the village Headmen opted to demolish the old and magnificent structure to reconstruct with the new material. The looks of all the new Chaupal buildings raised with grants from the government is completely devoid of aesthetics as the traditional design and embellishing styles were sacrificed. There could have been at least 500 Chaupals in Haryana that were adorned with all kinds of decorative elements traditionally appreciated. The Chaupal buildings of villages Kheri-Khanda, Julana and Jhamola were also outstanding examples in certain embellishing feature elements accomplished in chunam. Sri Ram and Bholar of Meham, the masons who had erected and embellished the Chaupal of Kheri patti in Kheri-Khanda village were expert architects as well as master artists. 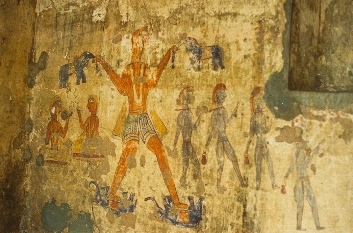 Of the two, Bholar Bagat, a resident of Meham, is said to have created a number of frescoes on the walls of the Chaupal building at Kheri-Khanda besides doing similar decorative work in several havelis and other Chaupals in the villages comprising Meham Chaubisi –a league of 24 villages settled in the vicinity of the Meham. An inscription secured on the wall in this Chaupal revealed that it was first erected in the year 1803 i.e. when the British first annexed Delhi, but a close inspection of the existing structure made it of a later date. In any case, the existing edifice must be 150 years old. It was also told that two large size figures of Sri Krishna and Sri Hanuman were created in deep relief method inside the Chaupal at Jhamola, which was jointly commissioned by the Narwal and Garhwals Jats inhabiting the old settlement in the village. The images were raised to 1½ size of the normal human being to appear as imposing and impressive. At other places such at Bhaini Amirpur, Mandi (dist. Panipat) and Baliana figures of saints and deities were carved in relief on the outer walls of the Chaupal to depict the religious temperament and reverential leanings of the people. It may be of relevance to mention here that upon the brick base, several type of embellishing work and figures could be created in chunam as it was soft, enduring and a malleable material. The frescoes created on the finely prepared surface of the chunam appeared aesthetically rich as it provided a good base with soft white glow and enduring too. Exposure and promotional challenges: It is very disappointing to note that the village communities have not only been able to ideally maintain their adorned edifices but also do not appear to be properly exposed to the heritage value of the decorated Chaupals. They have not only let the decorations and embellishing features gradually deteriorate and spoil but also do all kinds of anti-social activities inside the edifices such as drinking wine and even defecating. There were times when traditional singers used to be invited to sing legends and bhajans while playing melodious tunes on Sarangi. The legends of Heer and Ranjha were sung in the month of Srawana when the milch cattle suffered with certain communicable diseases such as foot and mouth disease. During long winter nights the legends of Jaimal and Fatta, valorous Amar Singh Rathore, Raja Jaswant Singh of Jhodhpur used to be sung in the Chaupals. Nowadays, these arrangements have become a thing of an era gone by. The traditional singers called Jogis are neither there nor a sense of taste among village folks survived. Instead they prefer holding distasteful Ragini competitions in the Chaupals which the tradition loving older generation does not approve. 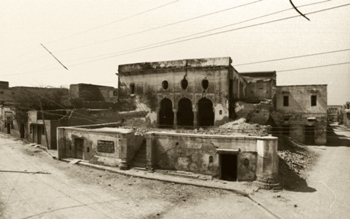 As a result of lack of awareness, many old Chaupal buildings raised in traditional Indian style have crumbled. The damage caused due to neglect of the structure and seepage of moisture in the foundation has further deteriorated the physical health of the structure. Obviously, the first casualty is the frescoes and the decorative features embedded in the wall as stucco. In view of the scenario, it has become pertinent for both the government and village communities to understand that the decorated Chaupals is a valuable asset that not only needs to be protected but also restored to its previous grandeur in a scientific method with the assistance of surveyors and architects trained to accomplish this task in a professional manner lest the vestige of the art heritage vanishes from the villages of Haryana.